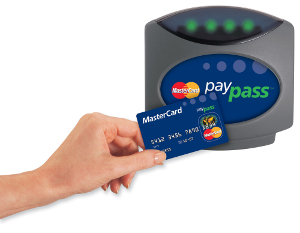 PayPass is MasterCard's RFID smart card. 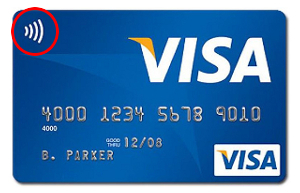 this Visa is a RFID smart card. Most Canadians aren’t aware that their new credit cards and even their enhanced driver’s license or passport may be at risk of a new type of identity theft. 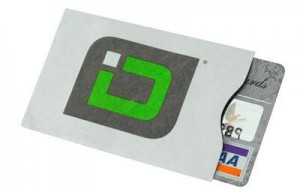 Many new credit cards are now using Radio Frequency Identification (RFID) chips. These “smart cards” don’t need to be swiped through a card reader. You can just waive them in front of a smart card reader at Tim Hortons, the grocery store or gas stations and the device automatically picks up your card’s information using radio waves. You already have one of these smart cards if your MasterCard says “pay pass” on it, your Visa has the “payWave” icon, your American Express is labelled “expresspay” or you only have to swipe a little stub to pay for your gas. While this new technology has the potential to make paying for things easier and shorten line-ups at stores, it creates an easy way for savvy thieves to steal your credit card information. Many TV and news programs along with concerned people online have been bringing this issue forward more and more. Recently the Global News investigative TV show, 16:9, featured a story on how this kind of identity theft works and how you can protect yourself. In the story, they show how a $3 smart card reader purchased online can steal people’s credit card information if the thief can get close enough to your purse or wallet. In the story they claim to have stalked 21 people in a mall and stole 9 people's credit card information. Fortunately, the RFID chips on these new credit card smart cards give off such a weak signal that someone has to almost brush a concealed smart card reader up against your pocket or your purse to read your card. However, new enhanced driver’s licenses and passports give off a much stronger signal that can be picked up from 30 to 50 feet away. Thankfully governments are aware of this problem and are now issuing new enhanced driver’s licenses and passports with protective sleeves that prevent the cards from being read until they are taken out of the sleeve. You can find a sleeve to protect your card by searching online for a “RFID blocking sleeve”. You can also make one yourself by wrapping your card in aluminum foil (if you don’t mind that in your wallet). While this new source of identity theft is concerning, statistically the chances of this happening to you are very slim. Surprisingly, the greatest threat to your credit and your finances is you. If you don’t use your credit cards wisely, you have the potential to cause yourself far more grief than an identity thief could. Pay off your credit cards in full every month. People who don’t do this typically add as much as 50% to the cost of everything they buy. Only use one or two credit cards. For special occasions, never put more on your credit cards than you can comfortably pay off in 3 months. Always shop with a list. This is a proven way of saving over 20% on your purchases. Always make your payments on time every month. As technology advances there will always be new ways to steal people’s personal information. Taking steps to protect yourself is your first line of defence, but the most important step is to protect yourself from the enemy within the gates—yourself. Learning to use credit and your money wisely is your best defence against threats to your finances. This website is loaded with information to help to help you learn to make smart decisions with your money. Feel free to explore and share your best tips with us as well. In this free online workshop you'll learn everything you want to know about credit reports, ratings, and scores. Find out what a credit score is, how it works, and how it's created. Getting an amazing credit score isn't as hard as you might think.